A magnificent birds eye view of 1920s Paris. The map is on rollers. 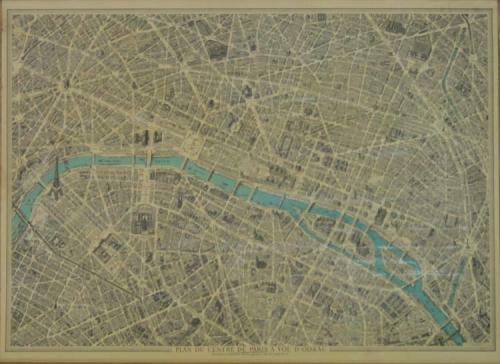 Mounted on canvas, this large map of the city is the ideal sketch of the entire city, touching on every block, building, garden and bridge. It's a postwar image thick with character and the detail that offers hours of study. The condition is good with some slight misfolds. The map is on a material rather like oilcloth or some synthetic material; the surface is a bit unevenly shiny and whiter in some areas than others; general appearance is rather yellowed and a small area is scuffed to white. Overall: stunning.